Strategic execution requires considerably more time, commitment, and resources than developing the plan itself. Unfortunately, most plans just end up gathering dust on the shelf, and those that do proceed to implementation often don’t receive the necessary attention and resources to achieve the desired outcomes. Implementation is the hardest part of strategic planning, but it’s also the most important. Our experienced professionals know how to bridge the gap between planning and execution to help organizations avoid unnecessary pitfalls and achieve exceptional performance. Strategy implementation is a process that puts plans and strategies into action in order to achieve strategic goal(s). That’s different than the strategic plan. The strategic plan is a roadmap about how to achieve a future state, but strategy implementation is the vehicle that gets you there. Through our “strategic implementation travels”, we have identified five key steps required to drive successful execution of your strategic plan. The first step in strategy implementation is to construct the right team. The organization must identify the right leader to be ultimately responsible for the overall implementation. Once an implementation leader has been established, work teams and team leaders can be identified for each objective. The last implementation step, which feeds directly into performance management, is to define a way of measuring your success. Quantitative data is an excellent way to determine if you are on the right track, making progress, and achieving outcomes. Once the leaders and work teams have been established for each objective, the next step is to identify the ideal projects to accomplish each objective. Due to many resource constraints, it’s impossible to make every project idea actionable. Consequently, a filtering system is required to prioritize potential projects based on criteria such as alignment with strategic focus, expected ROI, resource needed etc. to select the best options for implementation. In order to realize the efficiency of implementation, organizational alignment must be present. This includes aligning individual and department goals with organizational goals, aligning daily activities with strategic priorities, aligning operational processes with strategic management processes, and aligning internal resources. Effective communication and collaboration is a critical success factor here. Implementation is more than putting together a team and executing the plan. 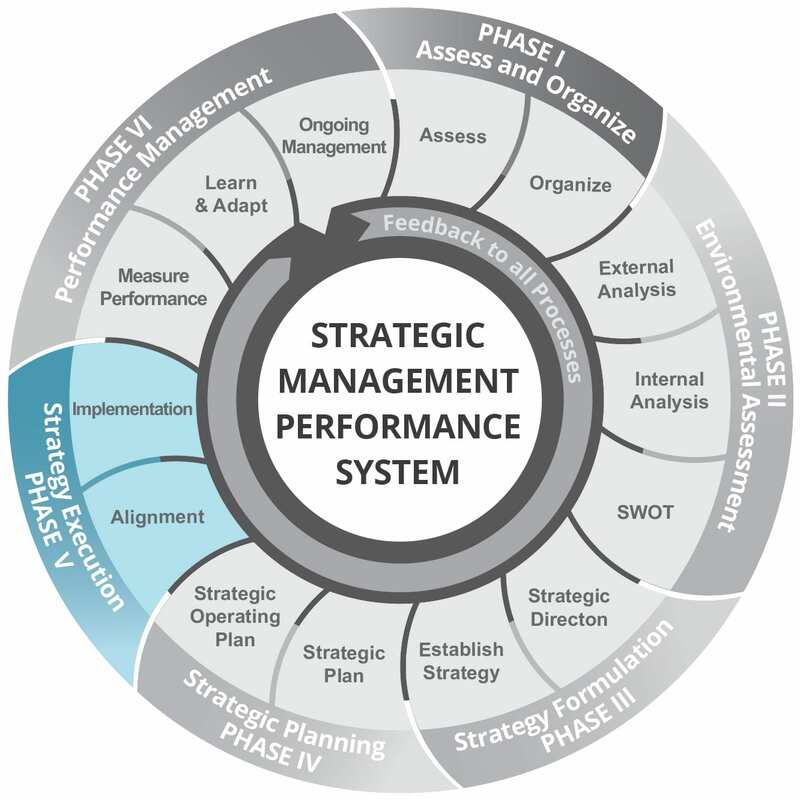 It’s a process that requires an ongoing system to evaluate performance and adjust the plan as needed. One key element in this system is to set up a reporting process linked to the board meeting calendar.